Elliptical Machine review. The American College of Sports Medicine (ACSM) defines a complete, well-rounded workout program as one that targets flexibility, cardiovascular, and muscle strength and endurance. To meet theses standards, you need a workout that engages the upper and lower body muscles in the arms and legs as well as the muscles in the body’s core, the supportive muscles in the back and abdomen. In addition, weight-bearing exercises that require your bones and muscles to support your body weight improve bone density and strength as well as muscular strength. If you are looking for one piece of space-saving exercise equipment that will provide you with all of those benefits, then you should give serious consideration to an elliptical machine. The easy motion of a Best Elliptical Machine makes it one piece of exercise equipment almost anyone can use. Best Elliptical Machine make it easy to begin exercising for the first time or to resume an exercise routine after a lapse or an injury. 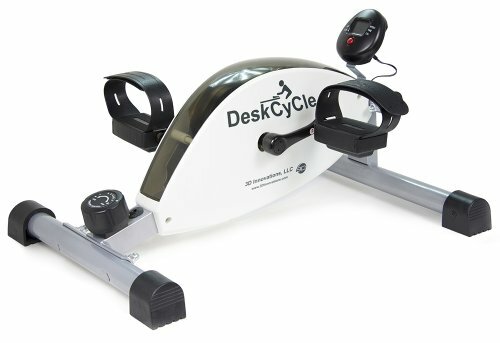 There are even under-the-desk models without handles that can be used to increase the physical activity of those unable to stand long enough to complete a workout on an upright elliptical machine. Because under-the-desk elliptical machines increase physical activity, they burn calories which can help you with weight loss. Because you must sit erect to use them, they improve your posture. When you use an upright elliptical machine, you burn even more calories. When you actively push and pull the handles and alternate between forward and backward pedaling, you receive an intense lower body workout for your calves, thighs, and buttocks and a moderate upper body workout for the muscles of your back, your pectorals, and your biceps and triceps in less than a half hour. Pedaling forward works the quadriceps at the front of your thighs while pedaling backward works the muscles in your buttocks and the hamstrings at the back of your thighs. Exercising without using the handles increases the benefits to posture and balance. Keeping your back straight and your posture upright while keeping some of your weight distributed over your heels, instead of placing all of your weight on the ball of your foot and your toes, distributes the effects of the workout more evenly to more of the muscles in your body. Whether you use an upright or an under-the-desk elliptical, you also benefit from the higher level of overall physical energy created by regular exercise as well as the mood enhancing endorphins and serotonins that your body produces in response to exercise. The Cubii Under Desk Elliptical solves problems with lack of activity for you if you are living an inactive lifestyle due to a physical condition or an office job. Instead of passive sitting, use the Cubii to engage in active sitting. The goal is to seek ways to burn more calories as you perform normal, non-exercise activities. The Cubii complies with NEAT, the science of Non Exercise Activity Thermogenesis developed by the Mayo Clinic’s Mayo Foundation for Medical Education and Research. Cubii uses NEAT under license from the Mayo Foundation. The pedals on the Cubii glide forward or in reverse like those on an elliptical so that you can use it under an office desk without banging your knees as you would with a device that pedals like a bicycle. The mechanism is designed to operate quietly, with a low hum, so that you won’t disturb others. The pedals on the Cubii also are placed at an angle that encourages you to sit erect as you use it, which engages and helps strengthen your core muscles while working the muscles in your legs, hips, and buttocks. As you become more fit, you can increase the resistance from your Cubii. However, because of the angle of the pedals, you cannot use the Cubii while standing on it. Cubii users burn an average of 150-180 calories per hour, increasing their energy expenditure by 84.5 percent as compared to the 16.7 percent increase gained from the use of a standing desk, according to one study. You can connect your Cubii to apps for iOS and Android via Bluetooth to set goals, to connect with other users, and to track calories burned, distance, time, strides, and RPMs. You also can sync your Cubii with your FitBit or Apple HealthKit. Assembly requires tightening four screws and takes 3-5 minutes. The Stamina InMotion Compact Strider can be used under your desk to participate in active sitting, or you can use it while standing upright on the large, non-slip pedals. Standing or sitting, it works the muscles in your legs, hips, and buttocks while burning calories. If you are sitting erect or standing, you engage and strengthen your core muscles. If you are standing, the Stamina InMotion Strider helps to improve your balance. Although the length of your stride is restricted by the compact size of this elliptical, one user created a HIIT workout by increasing the adjustable tension and, after a minute of normal pedaling, alternating 15 second periods of all out pedaling with 45 seconds of normal pedaling. This user reports that 10-15 minutes elevates his heart rate for a moderate cardio vascular workout while 25-30 minutes provides a more intense workout. The monitor, located at the front of the base, tracks calories, time, distance, and strides, but it could be difficult for those with poor vision to read. Looking down to read it also interferes with maintaining proper posture while exercising. The built-in handle makes this elliptical easy to transport from room to room or out onto a deck or patio for a change of view. You can even take it on road trips. The Gazelle Edge Elliptical Trainer is a manual, upright elliptical with extra-wide, non-skid foot platforms and high-density foam on the handles for a comfortable grip. The patented, dual action, split suspension system allows free-range of motion, putting you in complete control when making changes from an ambling walking speed to a full racing run and back again. The Gazelle Edge offers a calorie burning, cardiovascular workout that works the muscles of your legs, hips, buttocks, back, chest, and arms while improving your balance. It does lack an adjustable tension control, however, so you cannot increase resistance as your conditioning improves. The monitor, located on the crossbar at the front of the frame, tracks speed, distance, time, and calories burned, and it can be set to scan through those readings as you exercise. The sturdy, 1.5 inch rolled steel frame supports users up to 250 pounds. The frame measures 28” W x 43” L x 53.8” high and folds to 28” x 10” x 53.8” for storage. Users recommend allowing an additional 24-30 inches of clearance to the front of the frame when in use to allow for the movement of the gliders. Users also report that this elliptical can slide during use on hard flooring materials, so a mat is recommended. The Sunny SF-E905 Elliptical Trainer is an upright, manual elliptical that’s made to fit into small spaces without folding. It has large, non-slip foot platforms and two sets of handles. One set of handles moves, allowing you to get the extra cardiovascular benefits of adding arm movement to your striding while allowing you to work the muscles of your back and chest. The stationary handles contain the heartrate monitor and provide a handhold for getting on and off the elliptical or for use by those who are less sure of their balance; for those who want to spend part of their workout concentrating on their legs, hips, and buttocks; or for those with injuries that would be made worse by movement of the arms and back. The Sunny Elliptical pedals forward or in reverse. The large knob that controls the magnetic tension system is located below the console, putting it within easy reach for HIIT workouts. You have a choice of eight resistance levels. The monitor tracks calories, pulse, time, speed, distance for your current workout, and total distance. It can be set to scan the readouts or to display the one of most interest to you. The treadmill measures 28” L x 17” W x 57” H and weighs 60 pounds. It can be used by anyone weighing up to 220 pounds. Transport wheels at the front of the elliptical make it easy to move around indoors to where you can watch TV or outside to your deck or patio and then back to its storage space. To prevent your elliptical from rocking, swaying, or tipping, turn the adjustable leg stabilizers until the machine sits level. This compact size does limit the length of your stride to 11 inches. While even some users under 5’5” tall found the shortened stride to be a minor issue, others, even some up to 5’9” tall, did not consider it to be a problem. Some users stated that the elliptical began to squeak after use and that the bolts loosened and needed to be tightened. Others found that adjusting the cover over the magnetic tension assembly to eliminate rubbing, tightening the bolts, and lubricating the elliptical eliminated any noises. Some had difficulty with assembling the elliptical, particularly with connecting the cable to the monitor, while others did not. Several complained that the elliptical arrived with missing, cracked, or broken parts. The tools needed to assemble this elliptical come with it, although some reported missing tools. 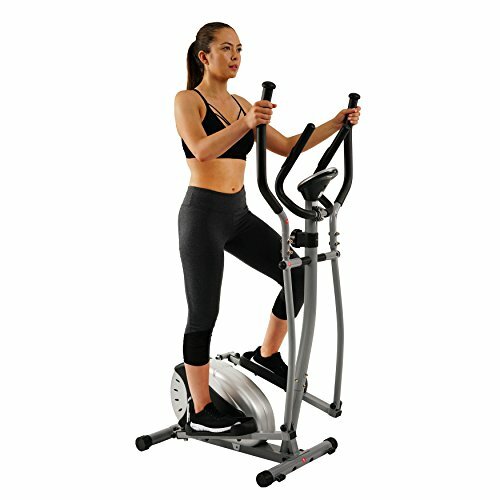 The Body Rider BRD2000 Elliptical Trainer and Exercise Bike is a versatile two-in-one manual exercise machine. 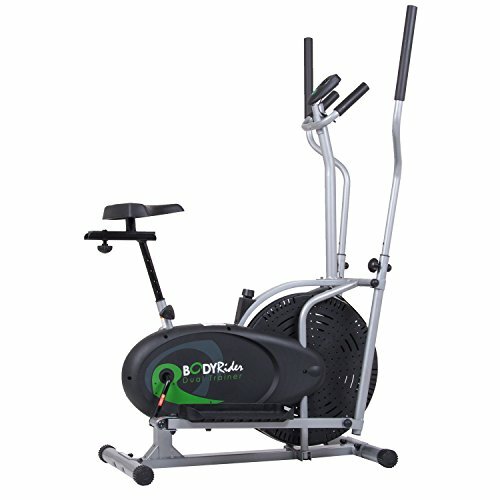 Those who aren’t able to stand can use the Body Rider BRD2000 as an exercise bike with an elliptical motion that is easy on the ankles, knees, and hips. As an exercise bike, it provides a calorie-burning cardiovascular workout while also working the muscles of your legs, hips, and buttocks. You also can use the moving set of handles while seated on the bike to up your heart rate and work your back, chest and arm muscles. Also, the seat adjusts both horizontally and vertically to accommodate users of different heights and leg lengths. Users report that the seat is uncomfortable, and they strongly recommend finding a replacement with more padding. Those who can’t stand through an entire elliptical workout can alternate between sitting and standing. The Body Rider BRD2000 may be the complete solution for someone who is going through the rehabilitation of an injury. It may allow them to progress from seated to standing exercises as they rebuild strength and stanima and recover range of motion. In addition, the Body Rider BRD2000 provides all the benefits of an elliptical machine. It has stationary handles to use when getting on or off the machine or when you want to work your leg, hip, and buttocks muscles without moving back, chest, or arm muscles, but it also has moving handles that sync with the foot pedals for a full elliptical workout. You can pedal in either direction. Whether you are using the Body Rider BRD2000 as a bike or an elliptical, the tension control is within easy reach for changing intervals for HIIT workouts. It operates on a gradual increase or decrease with no specific, numbered settings. The resistance is created by the resistance of the air passing over the high-momentum fan blade flywheel system. As a bonus, you’ll feel a gentle breeze from the fan as you exercise. The manufacturer’s recommended weight limit for the Body Rider BRD2000 is 250 pounds, but some users surpassed that by 20 pounds with no issues. 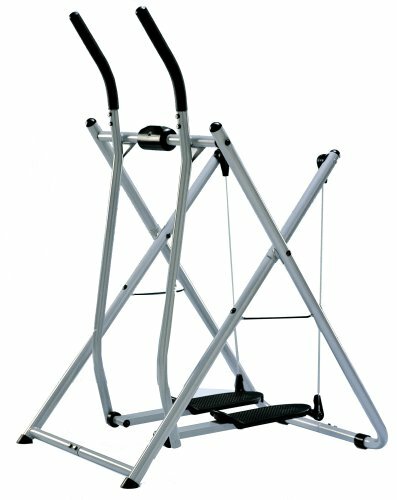 This elliptical measures 48” L x 28.5” W x 59.5” H and has a 22” stride. It weighs 66 pounds, and it has built-in transport wheels so that you can easily move to any exercise space you choose and then return it to its storage space. The Body Rider BRD2000 does not fold to a smaller footprint for storage, though. The monitor can display a single readout or scan through calories, time, speed, and distance. Users had some difficulty assembling this elliptical and recommend that two people work on it together. Some users also felt that the Body Rider BRD2000 was lighter weight and less sturdy than they expected, while others reported using happily it for months with no issues. If you have a small space and need a compact elliptical, but you area little heavier than the weights recommended for the previous machines, the Sunny SF-E3609 might be the answer. 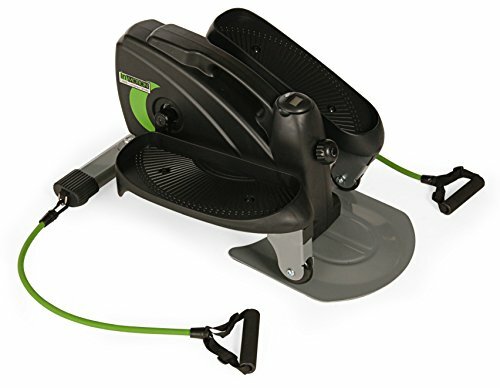 Like the Sunny SF-E905, the SF-E3609 has large, anti-slip foot platforms; a pulse monitor in the stationary handles; pedals that work in both directions; eight levels of magnetic resistance; an easy-to-reach resistance control for creating HIIT workouts; adjustable leg stabilizers; and an easy to read monitor that tracks heart rate, calories, time, the distance of your current workout, and your total distance. The major difference is that the SF-E3609 supports users up to 265 pounds. The SF-E3609 has a tablet holder below the monitor, and the monitor displays the room temperature in addition to your workout stats. It does not fold, but it measures 44.5” L x 24.6” W x 65.6” H. It has the same 11” stride as the SF-E905. It weighs 71.7 pounds, and it has built-in transport wheels. As with the SF-E905, some users found that they had to retighten bolts. Some report that the elliptical rocked and swayed as they used it while others had no problem. Users agree that the assembly instructions are exceptional, but they also agree that having two people is a good idea. While the elliptical comes with the tools needed to assemble it, some found that their own tools worked better. The 6-in-1 Elliptical Trainer with Exercise Bike and Home Gym Equipment includes an ab twister, push-up bars, two and three pound hand weights, resistance bands that can attach to the front or rear of the elliptical’s frame, and a water bottle holder. The ab twister is between the push-up bars, and that entire assembly attaches to the front of the elliptical. Hold on to the stationery handlebars to twist on the twister. The hand weights are in a rack on the column for the stationary handlebars and the monitor where you can easily grab them for weight training while you use the elliptical or the bike. The pulse monitors are on the moving handlebars, and these are positioned where you can use while working out on either the elliptical or the bike. The bike has an extra large seat which can be adjusted for your height. The tension control is easy to reach so that you can change the resistance to create HIIT workouts. You can pedal both forward and backward. This exercise machine supports users up to 220 pounds. The large easy to read monitor can scan through your pulse rate, calories burned, time, distance, and resistance level or display the single readout that most interests you. The ribbed dot design on the foot platforms prevents your feet from slipping, and, in response to your pedaling, a high momentum fan creates a mild breeze. 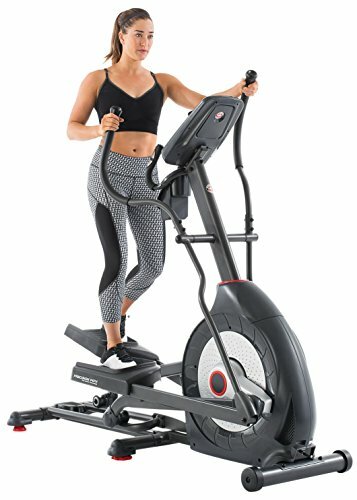 This 6-in-1 elliptical and bike measures 43.4” L x 19.7” W x 61” H with the push-up bars and ab twister attached, but these can be removed so that this machine can fit into a shorter space. The entire elliptical and home gym weighs 83.8 pounds. The frame does not appear to have transport wheels. Users report that the elliptical and bike are easy to put together, requiring approximately one hour. One user reported that, when he used it on a hard wood floor, the bike was quiet, but the elliptical was noisier than the bike. Another user commented that the push-up bars feel very sturdy. One more user mentioned that the equipment comes with a set of stretches to perform before using the machine. The ProForm Hybrid Trainer, like the Body Rider BRD2000, combines a recumbent bike with an upright elliptical. The ProForm Hybrid, though, provides a chair-like seat instead of a bicycle seat. When using this trainer as a recumbent bike, the foot platforms raise up at a 45° angle that allows you to push against them as you grip the handles on each side of the seat. You cannot reach the moving handles to use them while using the bike. The seat can be adjusted, notch by notch, along a rail. As you move it forward, it also drops lower. As you move it backward, it raises higher. When using the ProForm Hybrid as an elliptical, the foot platforms are flat and parallel to the base of the machine. You can use either the moving or stationary handles. The stationary handles include EKG Grip Pulse technology to track your heart rate. The ProForm Hybrid offers 16 resistance levels and 16 built-in workout apps that are compatible with iFit® technology. Place your Android or Apple tablet on the ProForm Hybrid’s extra wide tablet holder, connect with Bluetooth to iFit® Coach, and, with a subscription, you can select from a growing collection of GlobalTrek workouts led by top personal trainers at locations all over the world. You also receive nutrition information, and you’ll be able to track your progress. Plug your iPod or MP3 player into the ProForm Hybrid’s speaker system and enjoy working out to your own music selections. The tension control to change the level of magnetic resistance is within easy reach when you are using the elliptical, but you will need to lean forward when using the recumbent bike which could disrupt flow of your routine. The monitor provides a large, easy to read window, and in addition to tracking the standard information, it displays a power meter that translates your stats into the number of watts you are generating with your workout. The frame of the ProForm Hybrid includes a water bottle holder, which is located below the speaker. It also has transport wheels so that you can move it, but it is heavy. The frame supports users up to 350 pounds. It does not fold. It has a 15” stride and measures 57” L x 25.75” W and weighs 116.84 pounds. The seat measures 16” W x 10.5” D.
Users state that while assembly isn’t difficult, it takes approximately two hours. Some users complain that it squeaks. Users find that the seat for the bike is comfortable. Some are using the ProForm Hybrid as part of their rehabilitation after surgery or an injury while others use it to counter the effects of Parkinson’s disease. 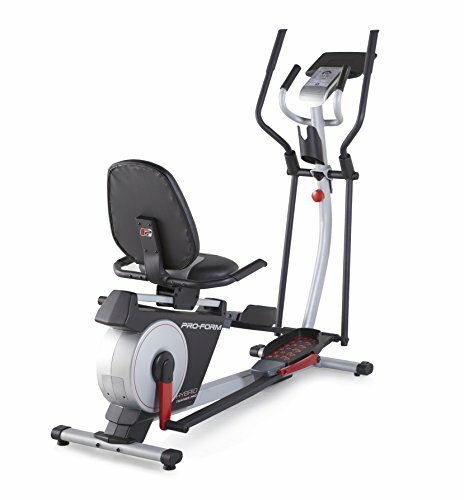 The Schwinn 430 Elliptical Machine provides 20 levels of resistance that are controlled by the computer on the Schwinn 430. The elliptical includes 22 pre-programmed workout routines. Nine of these are profile programs and eight target heart rate. Two are conditioning tests. One is a quick start program, and two allow users to design customized programs. With the Schwinn 430, you can set goals and track them on the elliptical’s dual track, two LCD screen system. This two window system lets you track up to 13 different readouts while also giving you easy access to the elliptical’s programs. With SchwinnConnect, you can export your workout stats and goals so that you can view progress reports online. The Schwinn 430 comes with a media shelf with a USB charger, an adjustable three-speed fan, speakers, and a water bottle holder. While the computer adjusts the resistance, you set the incline of the ramp manually. It has six positions within a 10° range. The large, cushioned foot plates provide a 20” stride. 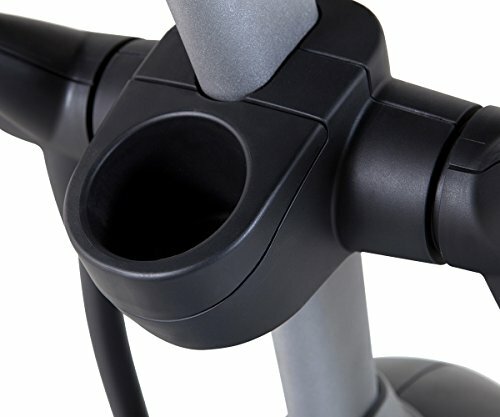 The moving handlebars are angled so that you can find a comfortable grip. The stationary handlebars contain the heart rate monitors, and they are ergonomically placed for comfortable use during heart rate programs. The frame has two built-in levelers, over-sized crossbar tubing, and center frame support for stability and durability. This elliptical is built to support users up to 300 pounds. It measures 70.1” L x 28.2” W x 63.2” H and weighs 182 pounds. However, it does have built-in transport wheels. Some users complain that the elliptical is noisy, but others disagree. Users do report that assembly takes well over an hour, so allow ample time and have a helper on hand. The NordicTrack E 7.0 Z Elliptical Machine comes 20 resistance levels and 20 exercise programs – 10 for performance and 10 for burning calories. Each of these programs was designed by a certified personal trainer, and the NordicTrack E 7.0 Z automatically adjusts the resistance to help you reach your goals. You can make adjustments to the settings and set up of the NordicTrack E 7.0 Z in addition to the automatic adjustments made by the elliptical. A button on the console lets you quickly and easily increase or decrease resistance levels. You can also manually adjust the incline with a choice of five positions within a range from 0° to 20°. The inclines are marked to indicate which muscle group is targeted from your calves (the least incline) to your hamstrings (mid-range) to your thighs (the steepest incline). With a subscription to iFit and the iFit app installed on your tablet, you can use Google Maps to chart your own custom route or select an iFit Coach Global Trek route. iFit displays Google’s Street View on your tablet. In addition, iFit records your long term progress and uses the information on your heart rate, the calories you burn, your speed, and your time and distance to tailor customized elliptical routines specifically for you. For fun, and for a change from the scenic GlobalTrek routes, you can track your progress while running a virtual iFit track meet racetrack. The NordicTrack E 7.0 Z supports users up to 300 pounds. The CardioGrip sensors on the stationary handlebars track your pulse. The backlit monitor displays that reading as well as calories burned, time, distance, and speed. A bracket above the monitor holds your tablet in place, while a water bottle holder below the console holds your water bottle. The dual speakers of the Intermix Acoustic Sound System connect to your iPod or MP3 player through a standard headphone jack. The NordicTrack E 7.0 Z measures approximately 67” L x 24” W and weighs 200 pounds. Users report that, while the NordicTrack C 7.5 has an adjustable stride and an incline that, with the iFit app, adjusts automatically to the terrain displayed by customized Google Maps routes, this is not the case with the NordicTrack E 7.0 Z. The stride on the E 7.0 Z cannot be adjusted, and the incline can only be changed manually. Users recommend having a helper to assemble the elliptical because some parts are heavy. While the tools for assembly come with the E 7.0 Z, users recommend using your own. Assembly takes two hours or more. Harvard Health Publications reports that an Elliptical Machine workout can burn 400 calories in 30 minutes. Vescape, a software company that creates interactive games for elliptical machines, states that an hour-long, low-intensity workout burns 450 kilocalories; an hour-long, medium-intensity workout burns 650 kilocalories; and an hour-long, high-intensity interval training (HIIT) workout burns 830 kilocalories. The more you weigh, the more calories you will burn within any given time period. Both interval training, which alternates periods of all-out activity with recovery periods of slower activity, and higher levels of resistance on the elliptical burn more calories. Benefits of an Elliptical Machine Workouts for Knee Pain, Back Pain, and Other Injuries Elliptical machines provide low impact workouts. Your feet glide on the pedals without ever losing contact with them. That means that elliptical workouts are easy on your feet, ankles, knees, and hips. Elliptical workouts benefit those recovering from knee surgery, the obese, the elderly, and those who have torn ligaments, varicose veins, arthritis, osteoporosis. Because Elliptical Machine workouts strengthen muscles in the back, abdomen, hip, and buttocks and restore range of motion in the hips, they can reduce back pain. However, the rotation in the arms and shoulders created by pushing and pulling the handles of an elliptical may not be advised in some back injuries, so always ask your doctor about pre-existing back injuries. Studies comparing Elliptical Machine workouts to working out on a treadmill and a Stairmaster found each provided similar improvements. Another study found that those using an elliptical achieved higher target heart rates than those using a treadmill at the same level of perceived exertion. This result is not unexpected because studies also show that arm movement during exercise walking also increases the heartrate above the rates obtained when the arms were held steady. A study by the University of Missouri found that those exercising on a treadmill and those using an elliptical machine had similar results for use of oxygen, heart rate measurements, lactic acid formation, and perceived exertion, but those using the elliptical machine experienced much less impact on their joints. Working out on an elliptical machine for 25 minutes three to four days each week is sufficient to improve your cardiovascular capacity and thus your physical stanima and endurance. When compiling our list, we sought out a wide assortment of Elliptical Machine. We hope that we have offered suggestions that fit into all budgetary, fat loss, weight loss, rehabilitative, and conditioning needs. We believe that ellipticals are an asset to every workout program as well as to rehabilitation programs to alleviate knee pain and back pain, and we encourage you to give serious consideration to adding one to your daily routine. 10. Cubii Under Desk Elliptical Provides increased exercise for the inactive. Can be used by almost everyone. Burns calories and works muscles in legs, hips, and buttocks engaging core muscles. Connects to iOS and Android and syncs with FitBit and Apple HealthKit. Interactive online user group for motivation and support. Provides increased exercise for the inactive. 9. Stamina InMotion Compact Strider Provides increased exercise for the inactive. Provides cardiovascular workout and improves balance when used while standing. Monitor tracks calories, time, distance, and strides. Lacks active workout for back and chest muscles. Monitor may be difficult to read for those with poor vision. 8. Gazelle Edge Elliptical Trainer Has an extra wide, non-skid foot platform. Allows free range of motion. Provides a calorie burning, cardiovascular workout for legs, hips, buttocks, back, chest, and arms while improving your balance. Scans speed, distance, time, and calories burned. Supports users weighing up to 250 pounds. Folds to 28” W x 10” D x 53.8” H for storage. Lacks tension control to adjust resistance. Requires 24-30 inches of clearance in front to allow for glider movement. Can slide on hard floors without a mat. 7. Sunny Health & Fitness SF-E905 Elliptical Trainer Compact size makes this elliptical ideal for small living spaces. Stationary handles contain a heartrate monitor and provide a handhold for those with balance issues and those who cannot exercise their back or arm muscles due to injury. Moving handles add to cardiovascular workout while working muscles of the back, chest, and arms. Magnetic tension system offers eight levels of resistance. Monitor displays a single reading or scans through calories burned, pulse speed, time, distance for the current workout, and total distance. Easy-to-reach tension control allows you to increase and decrease resistance for HITT workouts. Can be used by anyone weighing up to 220 pounds. Compact size limits stride to 11 inches. Some users complained of broken or missing parts, squeaking, and bolts that needed tightening repeatedly. 6. Body Rider BRD2000 Elliptical Trainer and Exercise Bike Consists of both a stationary bike and an elliptical. Allows for a progression from seated exercises to standing elliptical workouts. Moving handles can be used with bike and elliptical workout. Resistance can be adjusted easily for HIIT workouts. Pedals in both forward and reverse directions. Seat for exercise bike can be adjusted both horizontally and vertically. Users state that seat for exercise bike is uncomfortable and recommend replacing it. Some users felt this elliptical is lighter weight and less durable than they expected. Several users had difficulty assembling the elliptical and labeled it a two-person job. Assembly requires you to use your own tools, none are provided. 5. 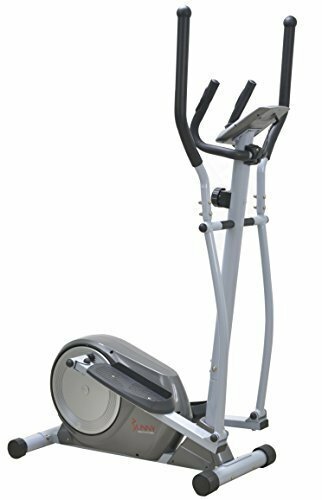 Sunny Health & Fitness SF-E3609 Elliptical Trainer Measures 44.5” L x 24.6” W x 65.6” H, allowing it to fit in small spaces. Supports users with weight up to 265 pounds. Offers eight levels of resistance with easy-to-reach resistance control to create your own HIIT workout. Allows forward and reverse pedaling. Monitor tracks heart rate from pulse monitors in stationary handles. Has built-in transport wheels and adjustable leg stabilizers. Comes with the tools needed for assembly. Some users report that it sways, rocks, and squeaks. Bolts loosen with use and need to be retightened regularly. Users state that tools supplied by manufacturer are low quality and recommend using your own. 4. 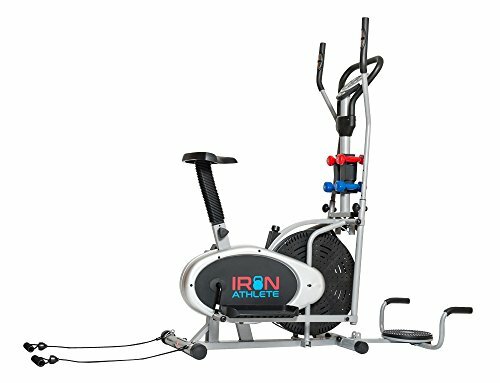 Superior Fitness 6-in-1 Elliptical Trainer with Exercise Bike and Home Gym Equipment Includes elliptical, bike, ab twister, push-up bars, two and three pound hand weights, and resistance bands in one piece of equipment. Hand weights are positioned for easy access while working out on the bike or elliptical. Bike has large, adjustable seat. You can pedal forward or backward. Equipment includes pre-workout stretches to do before stepping onto the machine. Pulse monitors are on the moving handlebars for readings as you work both upper and lower body. Monitor displays resistance level in addition to the usual data. Bike’s seat appears to adjust vertically but not horizontally. Frame appears to lack transport wheels, and machine weighs 83.8 pounds. 3. ProForm Hybrid Trainer Offers both a recumbent bike and an elliptical. The seat for the bike is comfortable and adjusts easily by sliding it from notch to notch up and down a rail. Provides 16 resistance levels and 16 workout apps. Compatible with iFit® Coach with GlobalTrek workout. Connects to iOS and Android tablets with Bluetooth for use with iFit® Coach. Includes tablet and water bottle holders. Can connect iPod or MP3 players to built-in speaker system. Subscription required to use iFit® Coach. Some users report that it squeaks. 2. Schwinn 430 Elliptical Machine Provides 20 levels of computer controlled resistance. Includes 22 preset programs – eight for heart rate, nine profile programs, two conditioning tests, and two for user customization. Exports user goals and stats to SchwinnConnect for online reports and tracking. Enables easy access to programs and tracking of up to 13 readouts with the monitor’s two window dual tracking system. Comes with media tray, USB charger, water bottle holder, three-speed fan, and speakers. Frame has built-in transport wheels, two built-in levelers, oversized crossbar tubing, and center frame support. Assembly is a lengthy process. Some users report that the elliptical is noisy. 1. NordicTrack E 7.0 Z Elliptical Trainer Offers 20 resistance levels and 20 preset programs – 10 for burning calories and 10 for performance. Resistance can be adjusted from a button on the console. Manual incline can be adjusted to work calves, hamstrings, or thighs. iFit uses your workout stats to create personalized elliptical programs for you. With iFit, you can use Google Maps to create your own customized route or choose a GlobalTrek route. The E 7.0 Z supports users up to 300 pounds. Speaker system connects through a standard headphone jack. Users report that the NordicTrack C 7.5 has an adjustable stride and an incline that adjusts automatically. The stride cannot be adjusted on the E 7.0 Z, and the incline adjusts manually. Users suggest having a helper and using your own tools when assembling the elliptical. Users state that assembly takes two or more hours.